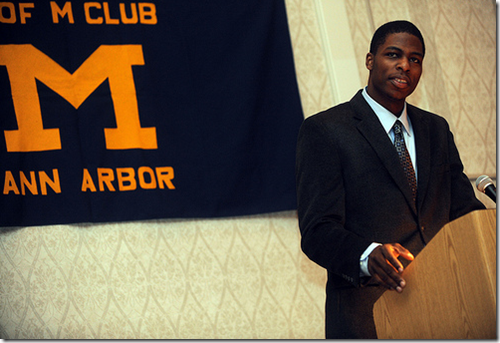 Last year Manny Harris won the team MVP award and shared it with DeShawn Sims. This year the script was flipped, Sims won the award and brought Harris to the podium to share it. Sims was deserving of the MVP in my mind so the decision seems fitting. There aren’t too many surprises in terms of who won what award. The most interesting winner was Blake McLimans, who won the Most Improved Player Award. This is great news because Michigan is going to need McLimans to contribute next year and the fact that he’s made strides in practice is certainly encouraging. Ben Cronin’s scholarship is available and he won’t play again. Akunne is back to walk-on status. 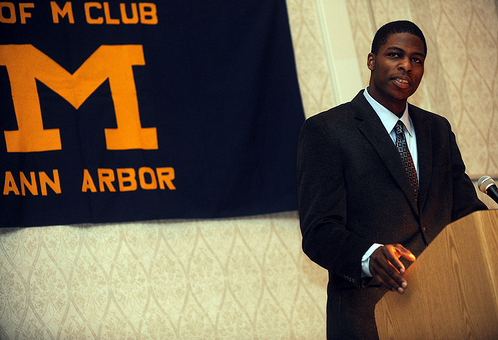 Beilein doesn’t anticipate Kelvin Grady returning to the team. Michigan plans to bid for the MHSAA finals.